Chaturmas Vrat, or Chatur Masam or Chaturmasya or Chatur Maas Vrat, is observed for a period of four months and it begins from the day after Deva Sayana Ekadasi in Ashada month and ends on Utthana Ekadasi in Kartik Month. Chaturmas 2018 dates are from July 24 and ends on November 19. It is of great importance to many Hindu communities. The months are dedicated to prayers, rituals and worships and therefore marriages, griha pravesh and other similar functions are not observed. Chaturmas is ignored in Kerala and to a certain extent in Tamil Nadu. Chaturmas begins on the Ekadasi day in Shukla Paksha in the month of Ashada and ends on the Ekadasi in the Shukla Paksha in the month of Kartik. It is believed that celestial beings and saints do not move around in the universe. They stay stationed at one place and perform Tapas and intense austerities. There is popular belief that all the Teerths (sacred rivers and ponds) in the world arrive at Braj Mandal for the four months. People visit Braj (Vrindavan and Mathura) during the period. The first month in Chaturmas, Shravan is dedicated to Lord Shiva, especially the Mondays. The next month is Bhadrapada, the month of festivals including the Ganesh Chaturthi and Krishna Ashtami. Then comes Ashwin month and the important festivals include, Durga Puja, Navratri, Diwali etc. Finally, Kartik, Diwali celebrations end in this month. Different types of vows and Vratas are observed by Hindus during this period. Hinduism and Nature is completely entangled and Nature plays a major role in important rituals and festivals associated with Hindu Religion. The Chaturmas occurs during the monsoon season and most of the important festivals in Hinduism take place during this period. Most of the important festivals associated with Hinduism are closely linked to agriculture and especially the harvest season. The monsoon rains brings joy, greenery and fresh air and the four months is considered highly auspicious and ideal for rituals, pujas and festivals. How to do or observe Chaturmas Vrat? Many people avoid non-vegetarian food during the four month period. Some people observe flexible fasting – eating just one meal or two, or just one meal on particular days in the month. Certain food items like jaggery or oil is avoided during the period or in any one of the four months. Some people avoid salty and sweet preparations. Those people who plan to undertake serious vows and fasting avoid garlic and onion as it can stimulate unnecessary excitements. There are no hard and fast rules regarding the Chaturmas Vrat. It is often left to the devotee to decide how he/she wants to spend the four months. Most people decided to read the Mahabharata or Ramayana or Gita or Bhagavad Purana during the fourth month period. Some people make it a point to visit temples daily and indulge in spiritual activities. 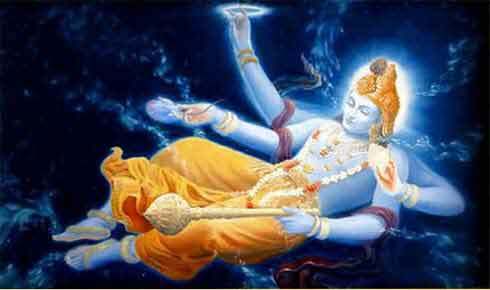 The four months is of great importance to Lord Vishnu devotees as this period is believed to be the night of Vishnu. Vishnu devotees listen to his stories and spend time in helping the poor and in cleaning and maintaining Vishnu temples. Importance is given to maintaining a healthy body during the four months, as the first two months are the peak monsoon season. Due to this reason, in some regions people avoid green leafy vegetables in the Shravan month. Curd, or yoghurt, is avoided in Bhadrapad month. Milk is avoided in Ashwin month. Pulses are avoided in Kartik month. Again there are no strict codes regarding food. It all depends on the person how he/she wants to observe the Chaturmas Vrat. The first month of the four month Chaturmas Vrat is known as Shaka Vrata. Shaka Vrata begins on Shukla Paksha Dwadasi day in Ashada month and ends on Shukla Ekadasi day in Shravan month. Shaka Vrata 2018 begins on July 24 and ends on August 23. During this one month fruits, vegetables, spices and dry fruits are avoided by Hindu communities that observe the Chaturmasya Vrata. All dals or pulses are consumed during the one month period. Black pepper, jeera, rava, sesame, ghee, milk, curd and butter are consumed. Vegetables and fruits are not used during Shaka Vrata. Also avoided are mustard, red chillies, turmeric, tamarind, methi, coriander, curry leaves, ginger, green chillies and lemon. The belief is that the four month Chaturmas Vrat is kept to flush out toxins and regain health. This is the reason why spices and dry fruits are avoided during the first month. The importance of the Chaturmas Vrat is mentioned in the Varaha Purana. The next cycle of Vrata is known as Dadhi Vrat – Shravan Shukla Paksha Dwadasi to Bhadrapad Shukla Paksha Ekadasi. Ksheera Vrata is observed during the third month of the Chatur Mas and is observed mainly in South India by certain Hindu communities. The month long Vrata is dedicated to Srihari Vishnu. Ksheera Vrata in 2018 begins on September 22 ends on October 20. Ksheera Vrata begins on the 12th day of the Shukla Paksha or waxing phase of moon in Bhadrapad Month. During this one month food prepared using milk are avoided by Hindu communities that observe the Chaturmasya Vrata. The Vrata begins on the Shukla Paksha Dwadashi in Bhadrapad month. All food made from milk is avoided in the month. Paneer, curd, butter, ghee etc are avoided. The belief is that the four month Chaturmas Vrat is kept to flush out toxins and regain health. This is the reason why certain particular food items are avoided during the four months. The next cycle of Vrata is known as Dwidala Vrata – Ashwin Shukla Paksha Dwadasi to Kartik Shukla Paksha Ekadasi. Dwidala Vrat is part of the Chaturmasya Vrata and is the last phase of the four-month Chaturmas Vrat. Dwidala Vrata begins on the Dwadashi day in Shukla Paksha (12th day during waxing phase of moon) of Ashwin month and ends with Kartik Shukla Ekadasi. In 2018, Dwidala Vrat begins on October 21 and ends on November 19. Dwidala Vrata is also known as Bhaubeej Vrat. Dwidala here implies those grams, lentils and seeds that break into two equal parts. Such lentils and grams are avoided during the period. Those lentils that are avoided are black gram, green gram, bengal gram, masoor al, horse gram, red gram, etc,. Some people also avoid green leaves during the period and those plants that produce vegetables with numerous seeds. Dwidala Vrat is only observed by some Hindu communities. Bhaubeej Vrat starts from Ashwayuja Dwadashi (12th day during the waxing phase of moon in Ashwin month) and ends on Karthika Shuddha Dashami (12th day during the waxing phase of moon in Kartik month). Bahu Beeja ends on the Vijayadasara Aradhana Day, and is the last phase of the Chaturmasya Vrata. Bahubeeja Vrata in 2018 is from October 21 and ends on November 19. During this period items made of Dwidala or Bahubeeja are to be avoided. Dvidala refers to any seed or vegetable which when broken or fried splits into two halves. Examples of such items are dals (pulses) and green peas. Bahu Beeja refers to any fruit or vegetable that contains multiple seeds and is covered by an external skin. Examples of such items are apples, grapes, pomegranate, and cucumber. People observing Bahubeeja Vrata usually consume banana and all banana products like Banana Kai (balekai - plantain), Baledindu, Bale Flower, etc. People also consume during the period Dantu soppu, Doddapatre Soppu, Agase Soppu, Karimevu, Genasu, Suvarna Gadde, Shame Gadde, Coconut and Hasi shunti. Bahubeeja Vrata is also referred as Dwidala Vrat.